Have you ever felt like you just can’t seem to calm your mind? Too many words and thoughts popping in and out? Have your raging thoughts ever effected your emotions, making it difficult for you to find stillness and peace? I have. Just yesterday I was trying to have my quiet time with God in my secret place. I tried sitting and praying. I tried reading. I was restless in mind and thought. I just couldn’t seem to break through. Then I got up and started to pace and pray to see if I could somehow get focus and concentration happening in my mind. Didn’t work. As a Christian, I believe that there is a spiritual world, and that the weapons I fight with are not carnal or material. They are spiritual. 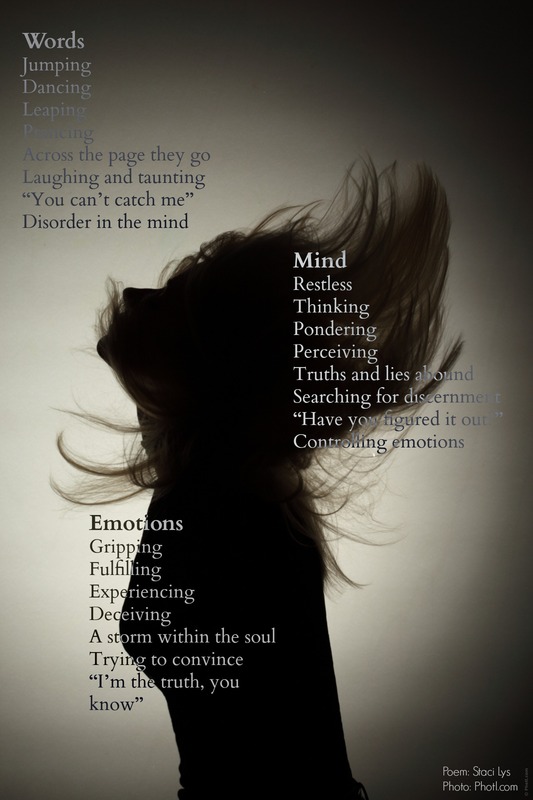 Oftentimes, I feel that the battle is in the mind, which in turn, affects the emotions. It is up to me to choose whether I’m going to believe the lies that are shot like arrows at me, or if I’m going to believe God. I chose God, because He never lets me down, and I can trust in His word. Even when feelings are up and down, He is constantly stable. Now you may not be a Christian, or believe in the spirit world, but I’m sure all of us have gone through similar experiences. How do you deal with bombarding thoughts and raging emotions? Do you go through some type of process, and if so, what is it?